By Laura - Brunei - 28 Nov/03 - Viewed 3289 times. For most of the year the Sultan's palace, called Istana Nurul Iman, is closed to the public. However, it opens its gates from the second day of Hari Raya for three days. It is the largest palace in the world, bigger than Buckingham Palace or the Vatican, and apparently has 257 toilets. The Sultan himself used to be the richest man in the world but is now second behind Bill Gates. We had to fly out of Brunei on the 28th of November and luckily our stay here coincided with the palace opening. We ended up visiting the palace on the first day that it opened, the 27th of November. We got up early and caught a bus from the centre of town (B$1.00) to the palace. The gates were already open and we followed the crowds walking up to the entrance. We had to fill in forms and then joined the queues, which were separate for men and women. It was 7:30 am and I wasn't expecting to be let through for at least an hour, but at 8 am the guards opened up the doors and started to let us through. We all had to go through an initial security check and after that we were given breakfast and met up with the men again. This was provided free of charge to every visitor and is very well organised. There were lots of curry and rice dishes, drinks and a selection of local cakes. I still wasn't used to the idea of curry for breakfast so I decided to sample the cakes instead. I had barely started eating them when it was time to start queueing again. Everyone waited patiently while hundreds of military personnel walked by. It seemed like the supply was never ending but eventually they all passed through and the women's queue started to move. At just after 10 am I got to point where I could see the end of the line. Women are not allowed to shake hands with men in Brunei, so women meet the Queen while men meet the Sultan. The Queen was very friendly and chatted with me briefly before I moved through. Right at the end of the queue everyone is given a numbered photo of the Sultan and a souvenir box with the royal emblem on it. Children are also given B$5.00. It was funny to see all the soldiers walking round holding a yellow lunch box. I caught a bus back to the hotel. Mark didn't get to meet the Sultan until about 12:30 pm and apparently he was very solemn and didn't say anything. I guess shaking hands with people for hours on end can't be very exciting. We spent the afternoon lazing by the pool where we were staying, the Terrace hotel (B$59.00 a night). 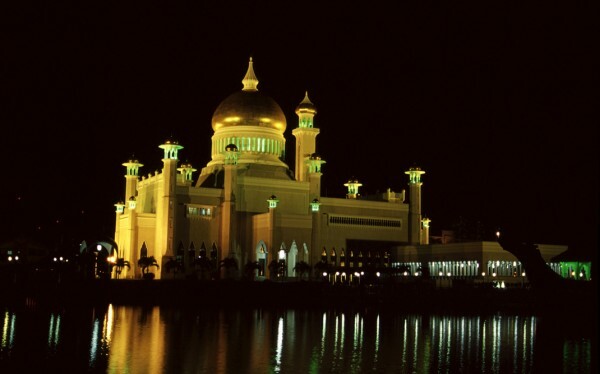 Before dinner we went to the Amar Ali Saifuddien Mosque which is set in its own lake and lit up at night. In the evening we planned to go to the Jerudong theme park. We had received several conflicting reports of whether it was open during Hari Raya so the receptionist at our hotel phoned up to make sure. She was told it would be open in the evening so we arranged return transport for a group of us for B$10.00 each. It takes about half an hour to get there and when we arrived we found it was closed. The speed limit in Brunei is 55km/h, even on the motorways. All cars and buses have a box on the dashboard that beeps when you approach the speed limit, so all the time you are driving along there is an annoying beeping sound. We stopped off on the way back to see the stunning Jame Asr Hassanil Bolkiah Mosque. We then returned to our hotel to pack for our flight the next morning.